Are we poised to see a new era of digital operations advisors? However which way we look at this, not even a third of decision-makers are relying on consultants in this ever-confusing market, when you would have thought consultants would be licking their lips at the opportunity. Don't these guys feed off confusion, hype and nervousness from the well-resourced enterprise leaders, only too keen to pay their rates to get a steer on what to do next? What's going wrong here? Consultants just don't do research. For example, I have yet to see a single set of publications from any of the sourcing advisors examining the performance of the RPA solution vendors. There are a million best practice pieces, but nothing of actionable substance. Clients want substance, not just the fluff. Clients are shifting to soliciting help from firms which can do the work and have the proven knowledge to support it, which is why so many are resorting to analyst reports to figure stuff out. Finally, we can stop freaking out at all these lovely projections, such as "AI will eliminate 1.8M jobs but create 2.3M" in the next couple of years, and "47 percent of total US employment" being at risk and "AI being possibly the last event in human history". Oh, and who can forget that recent whopper, "96% of clients are getting real value from RPA". We got so sick of this nonsense, we just went out and surveyed 400 enterprise automation and AI decision makers across the Global 2000, split across IT and business operations functions, and hit them with some very straight poignant questions about their attitudes, satisfaction levels and genuine plans for both AI and Automation across their business operations. What's clear is that enterprises are frantically evaluating their talent (81%) and looking to collapse these silos in the middle/back offices to improve their customer experiences. And they see AI, Machine Learning, and process automation as the levers to achieve this. Automation is the number one strategic priority four-fifths of enterprise C-Suites are placing on their operations. 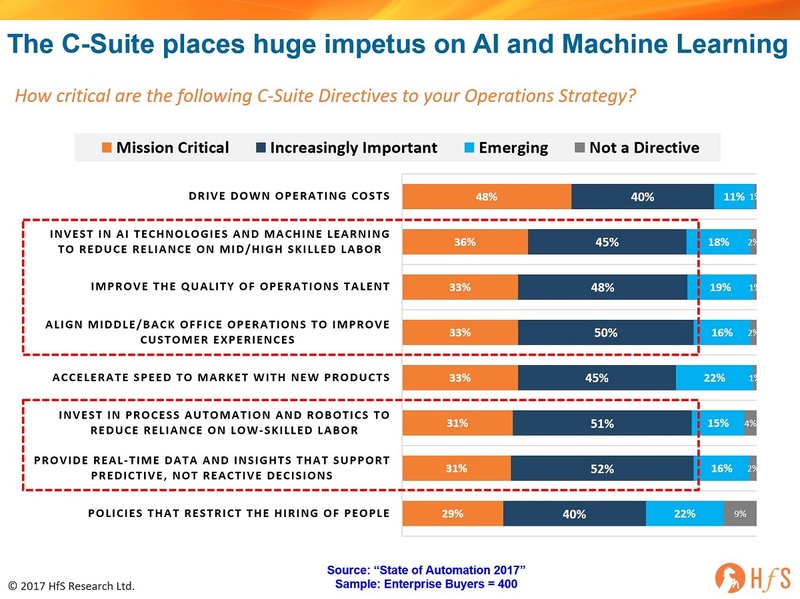 Enterprises see AI and machine learning (81%) and process automation and robotics (82%) as important C-suite directives toward operations strategy – higher than any priority other than cost reduction. 98% of enterprises have an automation agenda, but a third already have embedded it into their service delivery. Every organization today needs to have an automation strategy and that is reflected in the responses in our survey; only 2% suggest not having a strategy as of now, while 20% are in the process of formulating their strategy. Already, 31% of enterprises are integrating automation into the fabric of their service operations. Others are setting up dedicated CoEs (18%) and working with service providers (13%). Corporate leadership and IT are most active driving the automation agenda. Decision making is increasingly being led by the CEO (54%), CIO/IT Director (57%), and CFO/Finance Director (35%). Additionally, a diverse group of automation influencers and stakeholders emerge, notably the finance department (49% consider as influencers), procurement (47%), data center managers (51%) and purchasing managers (48%). Phil Fersht, CEO and Chief Analyst, HfS Research: Good afternoon Rajan - thank you for your time today. We would love to hear more about Wipro's digital strategy. We have been hearing a lot about the opening of your new centers and the recent acquisitions of Designit and Appirio. There really seems to be a lot of energy around the strategy here. Maybe we could start with a bit about you, Rajan... could you tell us a bit about yourself, your background and how you came to be leading Wipro Digital? Rajan Kohli, Senior Vice President and Global Head, Wipro Digital: It's a great honour to be speaking to you, Phil. I have spoken to you many times before, but this is the first interview with you specific to Wipro Digital. So thank you. It's here. The RPA Bible. Click to download your copy of the definitive RPA Bible: Your practical and technical guide to RPA. It was good times revisited in Bangalore last week, where the Indian-heritage BPM (BPO) services firms gathered for their annual reality check, courtesy of NASSCOM, India's leading IT and BPM services body. We were pleased to get the chance to meet with many of the industry's finest and have some frank exchanges on what this industry must do to stay relevant and keep eking out a growth curve. And, similar to the recent HfS summit in Chicago, the conversation has moved rapidly along in recent months with a genuine buzz of excitement about the future. 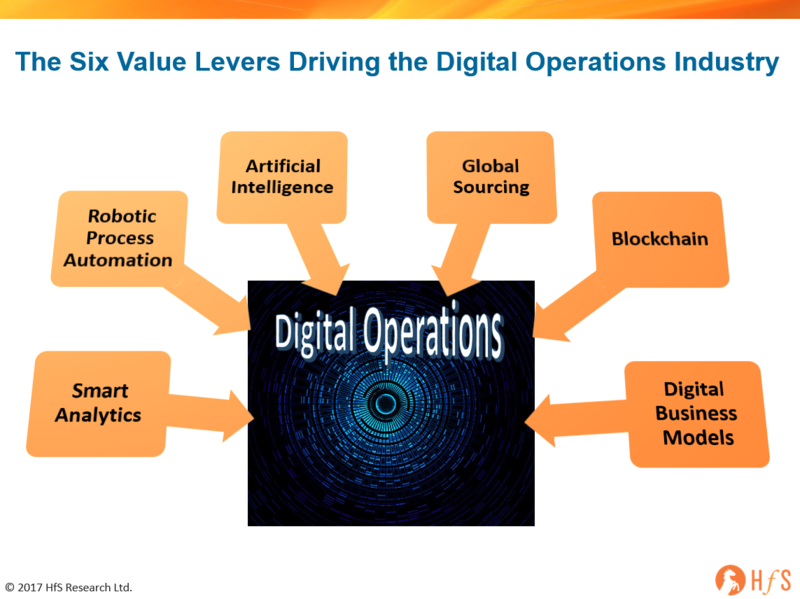 In short, most folks are stepping out of the comfort zone and attempting to embrace the emergence of technology-driven value levers as part of the very fabric of the future of business process services. However we look at this, we're becoming a data services industry that supports the inexorable enterprise drive towards Digital Operations. 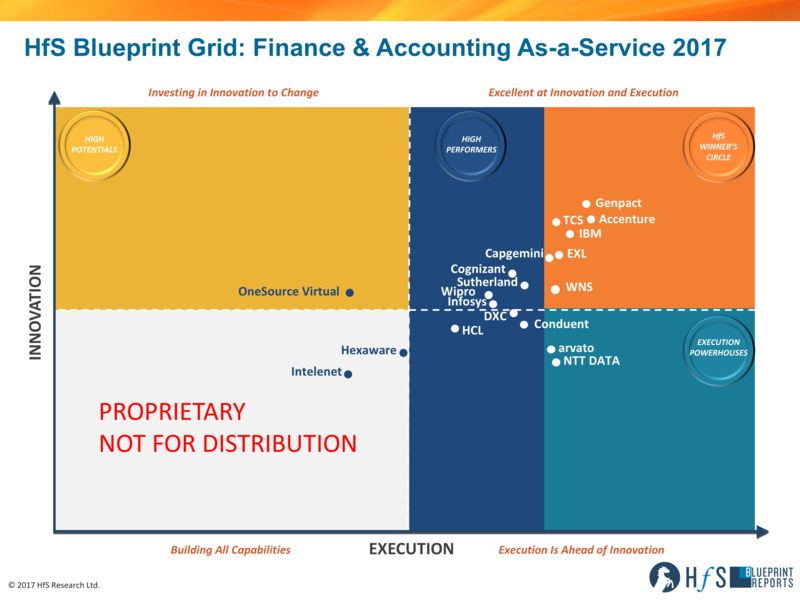 The HfS Blueprint is a guide for the service buyer to learn more about what to expect by engaging with a service provider. What does this service provider bring to the table above blocking and tackling? Where does the buyer need to challenge his or her own assumptions or organizational culture to see impact beyond tactical conversion of tasks from human to robotic automation or labor arbitrage? How does the service provider need to engage to provide long-term value – beyond green light SLAs for turnaround time and data accuracy? Many service buyers, from our research, are mostly interested in low-cost standard delivery. What will get that next level of efficiency and cost savings – and how does robotic process automation (RPA) play a role in it? What is the balance of RPA versus lower cost delivery centers – movement from 1st to 2nd to 3rd tier cities, to use industry terminology? In too many cases, labor arbitrage conversations are being replaced by robotic labor arbitrage – a combination of lower cost delivery locations and RPA. The industry is at an inflection point -- do service buyers and service providers have a choice to make – (a) move up the value chain with strategic collaboration – defining and addressing business problems, outcomes, and designing appropriate solutions that use digital technology or (b) promise 40-50% further improvement through digitization or automation, a tactical approach. Or is there a combination in play? The industry sits on this knife’s edge today. Last year many of the finance and operations leads we spoke to for this study when asked about RPA, were, with few exceptions, in one of two camps: had heard of RPA or hadn’t. This year, every client is familiar with RPA and has some kind of status to share, ranging from “discussion” of how and where to use it, working on a business case, or already using it either in-house or with service provider partners. It’s driving change in how the industry thinks about operating models, contracts, governance, partnerships, talent development, and change management. Earlier adopters in the business are realizing that automation for the sake of using the technology or in trial/pilot is not as impactful as when there is a business case for change in partnership with IT to achieve a targeted outcome for a process, e.g., touchless invoicing. There is a disparity in the market as to whether clients want/will develop and keep intelligent automation capability in-house or partner with service providers. We heard examples of both decisions. There is a current trend in “considering options” as contracts come up for renewal. A number of service buyers shared their stories of re-bidding parts or all of their finance BPO contracts to (a) create balance in a service portfolio to have strategic partners where there is stronger alignment on strategy and culture as well as thought leadership for finance and tactical partners to address the transaction and increased use of RPA; (b) shake up service providers that clients believe are complacent, e.g., not consistently raising the bar or challenging the status quo. Clients are (a) kicking it up a notch in partnering for the long –term with strategic roadmaps, (b) getting impatient with service providers that seem to be “resting on their laurels,” complacent, or just not aligned or insightful about the client culture or work/objectives, and (c) more willing to look beyond the traditional market leaders to “up and comers” who can prove trustworthiness, credibility and cultural alignment. This was reflected in scores for “value of engagement over time.” With the increasing mix of technology – platforms for procure-to-pay, record-to-report, and order-to-cash, as well as robotic and cognitive computing – in the business process services market, clients need to be looking at where and how service providers are investing in their own and third-party software, technical and business/consulting talent, and change management. Our study included over 60 client interviews as well as surveys, service provider briefings, and additional research and analysis covering the vision and operationalization of F&A As-a-Service. All of the participating service providers are making investments and progress in some way towards a more insight-driven, digital-enabled finance function. The ones that have the clearest and compelling vision and scale as well as roadmap and evidence of investment and progress toward landed in the Winner’s Circle. However, there are also some unique value propositions by players on the whole map. As always, we recommend that when you as a service buyer – finance, procurement, or operations executive – are evaluating a service provider for a new or existing business process services engagement, that you consider that best fit for your organization. Criteria, as reflected in our methodology for the blueprint, should cover culture, strategic, technical, and corporate alignment. In case anyone thought we were going soft, we're proud to announce another feisty outspoken analyst to the HfS family to help drive our coverage of industries - most notably the hi-tech and banking sectors - Elena Christopher. Elena - it's just terrific to be working with you at HfS! Can you share a little about your background and why you have chosen research and strategy as your career path? It's wonderful to join the HfS family. Research and IT and business process services have been the prevailing themes of my professional life. I realized while in university studying social science that research and its various methods provide valuable insights into whatever topics you apply it to. In my second job out of school, I was fortunate to be hired by Dataquest (Gartner), which afforded me the opportunity to learn the IT and business process services industries from the ground up. I never looked back. Since 1994, I have served as either an advisor or supplier partner to clients in most commercial industries, working to make sense of the various waves of seminal change in how businesses operate. So why did you choose to join HfS... and why now? And didn't you want to go back to one of the traditional analyst houses? I started my career as an analyst with Dataquest/Gartner. After nine years, I went into industry to build practical experience to complement my theoretical knowledge. I've been in the supplier world for the past ~15 years building and running services businesses. I was resolute in wanting to come full circle and connect my practical experience with my analyst skills. However, I only wanted to go with a firm that was doing things differently and one with which I personally had derived value. I was very attracted to HfS' approach of tackling and breaking down the major trends and issues in an incredibly timely fashion with much of the research accessible open source. I also appreciated the independent perspective and use of enterprise data rather than substantial reliance on supplier research. And as a services research company it is perfectly aligned with my experience base. So where is the services industry right now, Elena? Do you see us in a transition state, or is something else bubbling to wake us all up? We are most certainly in a transition state - with most industries in the process of being remade as disruption and enabling technologies change the fundamental concepts of business as usual. The services industry is enabling much of this transformation but it is also in throes of change with increased impetus placed on platform-based models and business outcomes. So what can we expect to see from you at HfS... can you give us a little snippet of what you're going to be working on? l'll be driving the industry-specific research agenda for HfS - digging into the major trends impacting each in-scope industry and the implications for business process and IT services. I'll collaborate with my fellow analysts to cultivate the industry angle on major trends such as automation, artificial intelligence, blockchain, digital business models and smart analytics. My primary coverage areas are High-Tech and Banking. In addition, I'll drive the industry point of view across HfS research. And finally, is the analyst industry going as exciting as it was 10 years' ago? Welcome back to the analyst community, Elena - am sure you'll find HfS a fascinating laboratory for observing the next phase of this industry!